Norway builds a memorial to 77 victims of the worst in the country’s modern history terrorist attack, which happened on July 22, 2011. Almost three years ago there was a huge explosion in the heart of Oslo. And Anders Breivik wearing police uniform shot several dozen students of a summer camp of the Norwegian Labour Party on the island of Utoya. Architects and sculptors from around the world attended the competition of the Memorial projects. And Swede Jonas Dahlberg was announced the winner of the competition. He developed a two-part project that was the most meaningful and interesting from an architectural standpoint. 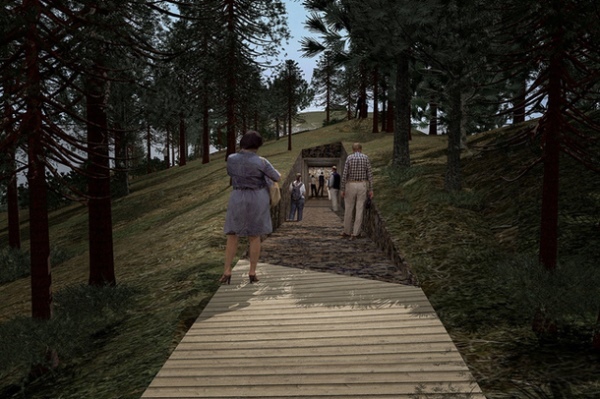 Memory Wound memorial will be built on the Serbroten peninsula, from where the Utoya island is clearly visible. 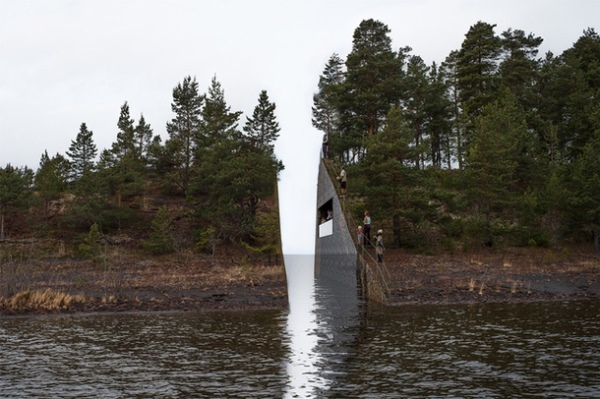 The memorial will be carved in the rock gorge trim with width of 3.5 m, that represents grief of loss and the length of time to divide the history of Norway on “before” and “after”. Wooden flooring, padded through the forest, will lead to the balcony of the tunnel inside the rock. The names of those who died will be engraved on the perfectly polished opposite wall. The inscriptions will be close enough to read them, but too far away to touch. The rock from the Memory Wound gorge will be brought to the center of Oslo, where the minibus was exploded. Jonas Dahlberg called the second part of the project “Time and Movement”. The artist says that the idea came to him when he got to the island of Utoya, which became the symbol of grief and tragedy for the Norwegians. According to the designer, despite the fact that they were standing right there, where dozens of people were killed, he noticed how active nature was restored after the tragedy, healed its wounds, tightening the traces of what happened. The first impression brought the artist to the main concept of the project – the memorial should not be a building with empty echoing rooms, sculptural composition or monument in the conventional sense. The artist decided to perpetuate the memory of the dead with the help of land art – the art, in which the landscape becomes the main expressive means, materials and facilities.